This weeks Wednesday’s Weekly Savings Tips is on, saving time on dinner with Crock Pot Pork Chops! Not sure what weekly tips are? You can read what they are about here. I have always been someone that loves to cook with my slow cooker. It is so nice to be able to throw stuff in the cooker in the morning, then after a hard day of work you don’t have to worry about dinner! 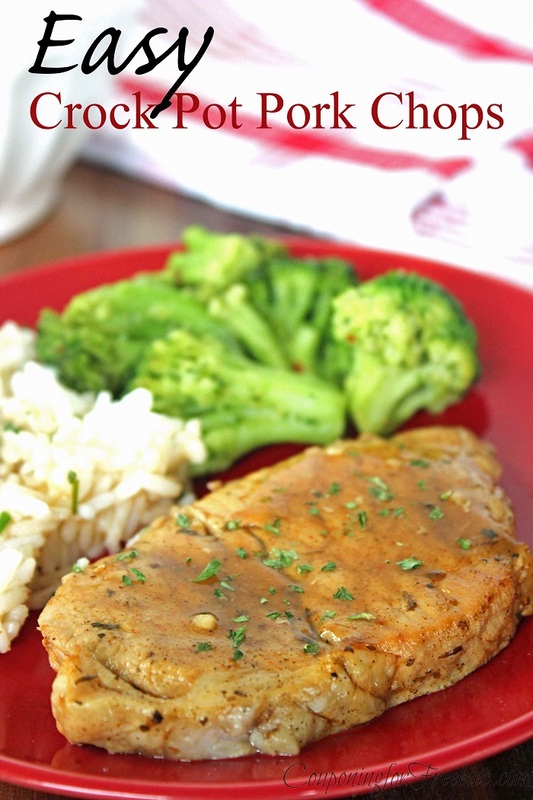 Well this week I am sharing a yummy Crock Pot Pork Chops recipe with you. They go great with a quick steamer bag of broccoli and a pouch of just add water mashed potatoes, or even a steam bag of rice! If you like to have that golden brown look and taste, you can first brown each side of the pork chops in a pan with 1 Tbsp olive oil. That is a optional step and is not required if you do not want to do it. Now put the pork chops in your slow cooker. Then mix remaining ingredients together and pour on top the pork. Place lid on the slow cooker and cook on high for 4 hours. If you are wanting it to cook longer, you can put on low for 7 hours. Need a gravy to go with it? Simply mix 1/4 cup water and 1 tbsp cornstarch with a whisk until it is nice and smooth. Then add that mixture to a little of the liquid from the slow cooker. Heat and keep whisking until thickened.